We have released a new update for our feature packed event booking system for Joomla. 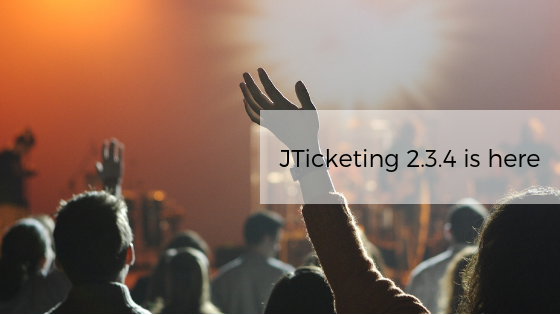 We are happy to release JTicketing 2.3.4 which primarily adds support for Joomla 3.9.x privacy tools suite. This release introduces two new plugins: action log plugin and privacy plugin for JTicketing. Besides this, we have also fixed plenty of bugs and security issues in this release. Actionlog plugin for JTicketing allows site administrators to log actions for activities integral to JTicketing like events, event orders, users, venues, coupons and attendee fields of the site users. This plugin is by default disabled on fresh installations, site admin can enable it if needed. Note that the logging actions can be turned off by disabling the plugin.